One of my favorite magazines, Significance, printed an intriguing image of a symmetric matrix that shows repetition in a song's lyrics. The image was created by Colin Morris, who has created many similar images. When I saw these images, I knew that I wanted to duplicate the analysis in SAS! The analysis is easy. Suppose that a song (or any text source) contains N words. Define the repetition matrix to be the N x N matrix where the (i,j)th cell has the value 1 if the i_th word is the same as the j_th word. Otherwise, the (i,j)th cell equals 0. Now visualize the matrix by using a heat map: Black indicates cells where the matrix is 1 and white for 0. A SAS program that performs this analysis is available at the end of this article. There are 18 words in this song. Words 1–3 are repeated, as are words 1-–13. You can use the SAS DATA steps to read the words of the song into a variable and use other SAS functions to strip out any punctuation. You can then use SAS/IML software to construct and visualize the repetition matrix. The details are shown at the end of this article. 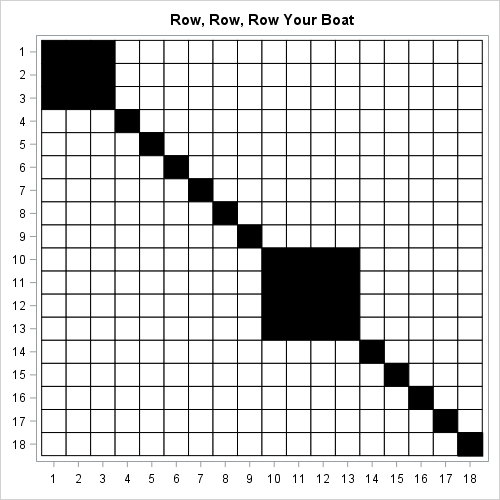 The repetition matrix for the song "Row, Row, Row, Your Boat" is shown to the right. For this example I could have put the actual words along the side and bottom of the matrix, but that is not feasible for songs that have hundreds of words. 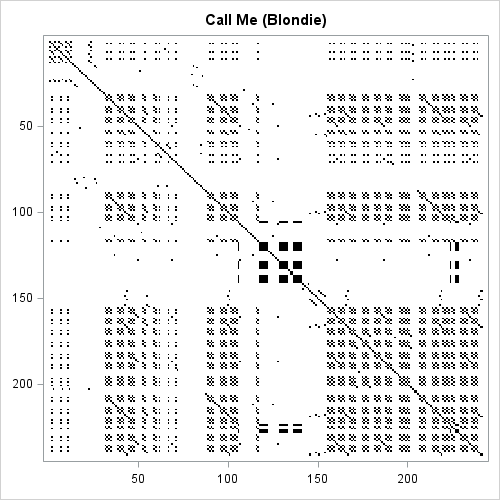 Instead, the matrix has a numerical axis where the number indicates the position of each word in the song. As mentioned, this song has very little repetition. One way to quantify the amount of repetition is to compute the proportion of 1s in the upper triangular portion of the repetition matrix. The upper triangular portion of an N x N matrix has N(N–1)/2 elements. For this song, N=18, so there are 153 cells and 9 of them are 1s. Therefore the "repetition score" is 9 / 153 = 0.059. The repetition score for this song is 0.087. 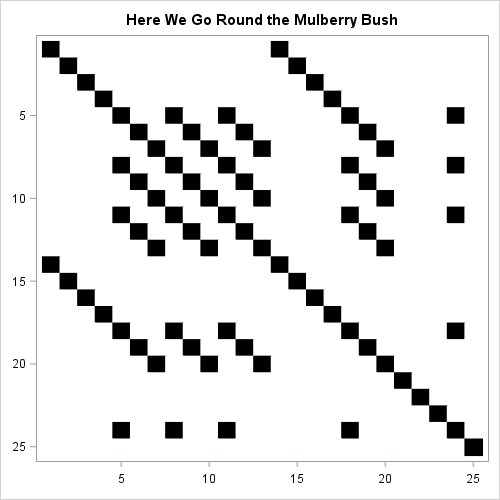 You can see diagonal "stripes" that correspond to the repeating phrases "here we go round" and "the mulberry bush". In fact, if you study only the first seven rows, you can "see" almost the entire structure of the song. The first seven words contain all lyrics except for four words ("so", "early", "in", "morning"). Let's visualize the repetitions in the lyrics of several classic songs. 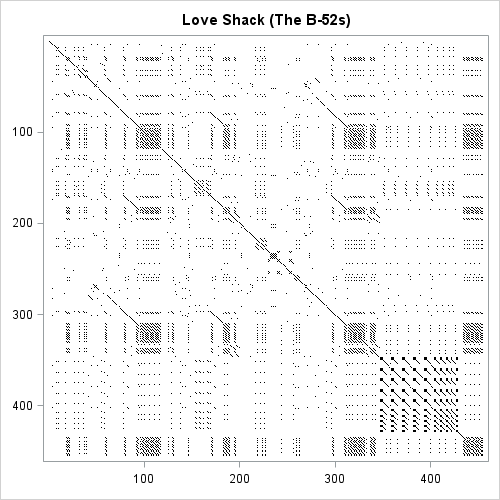 The second song that I wanted to visualize was "Love Shack" by The B-52s. In addition to a title that repeats almost 40 times, the song contains a sequence near the end in which the phrase "Bang bang bang on the door baby" is alternated with various interjections. The following visualization of the repetition matrix indicates that there is a lot of variation interspersed with regular repetition. The repetition score is 0.035. If you think this is a fun topic, you can construct these images yourself by using SAS. If you discover a song that has an interesting repetition matrix, post a comment! In SAS/IML software you can use the ELEMENT function to find the locations in the i_th row that have the value 1. After you construct a repetition matrix, you can use the HEATMAPDISC subroutine to display it. 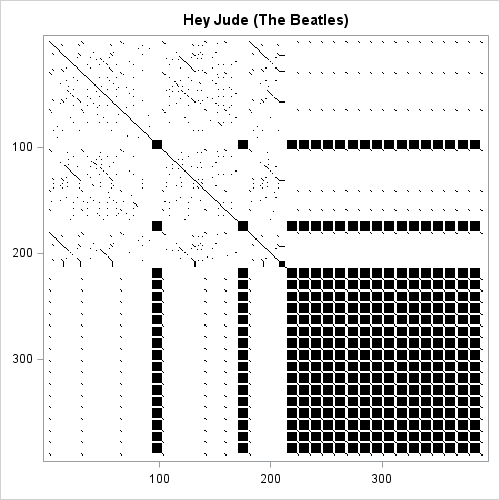 For example, the following SAS/IML program reads the words of the song into a vector and visualizes the repetition matrix. It also returns the repetition score, which is the proportion of 1s in the upper triangular portion of the matrix. If you want to reproduce the images in this post, you can download the SAS program for this article. In addition, the program creates repetition matrices for "We Didn't Start the Fire" (Billy Joel) and a portion of Martin Luthor King Jr.'s "I Have a Dream" speech. You can modify the program and enter lyrics for your favorite songs. The post Visualize repetition in song lyrics appeared first on The DO Loop.